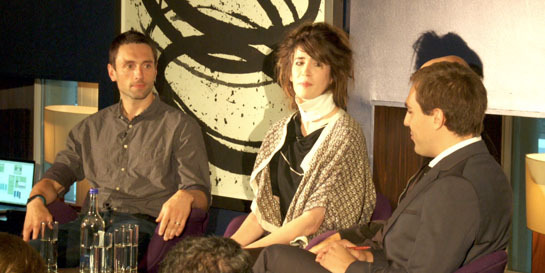 This week I spoke at Wired’s Future of Music event with Michael Breidenbruecker (founder of RJDJ) and Imogen Heap. As a long time Wired reader it was great to be invited to join the panel, and from a Universal perspective it’s really important to meet people from the tech community and talk about the digital side of the company. After the discussion and questions from the audience I spent some time talking to people from a range of industries – small label owners, the publishing world, the artists community and TV. While there is a lot of shared ground, each also had a view and insight on digital and I learned something new from all of them. There was some interesting debate (some of which you can see on Twitter) and a mind-blowing performance from Imogen Heap, an artist who uses digital technology in her performances –I definitely want to get hold of some gloves like hers. If you couldn’t make it on the day but are interested in the discussion there’s a write-up on the Wired website and a podcast on the Future of Music (featuring yours truly) will go up today.